BAM 2017 Tour began in Walker, Minnesota, with overnights in the host communities of Bemidji, Park Rapids and Staples before ending in Walker. Northern Minnesota has incredible scenery with crystal blue lakes, the smell of pine in the air, much to explore and nearly guaranteed beautiful sunsets every evening. Each day cyclists rode between 65 to 75 miles with a Century option on Day 2. Riders pitched their tents on Walker’s beautiful Leech Lake-front park before heading out on Thursday, August 24. Walker is always a nice stay with many sights to take in including the Walker General Store (a vintage-inspired shop that will take you back in time), Aunt Belle’s Confectionary (a drool-worth candy store), and many beautiful and winding roads and trails in the area, including the Shingobee Trail. Thursday, August 24. Day 1. Walker to Bemidji. 64 miles. 1,200 feet of climbing. Day 1 of cycling headed north along country roads and portions of the Heartland, Paul Bunyan and Mi Gi Zi trails while winding through the Chippewa National Forest. Many stopped to visit Lyle’s Logging Camp and Cass Lake Museum along the way. In beautiful Bemidji, we camped on the shore of Lake Bemidji and riders toured the Beltrami County History Center, the Headwaters Science Center, and Bemidji Brewing and more! Friday, August 25. Day 2. Bemidji to Park Rapids. 72 miles. 2,300 feet of climbing. 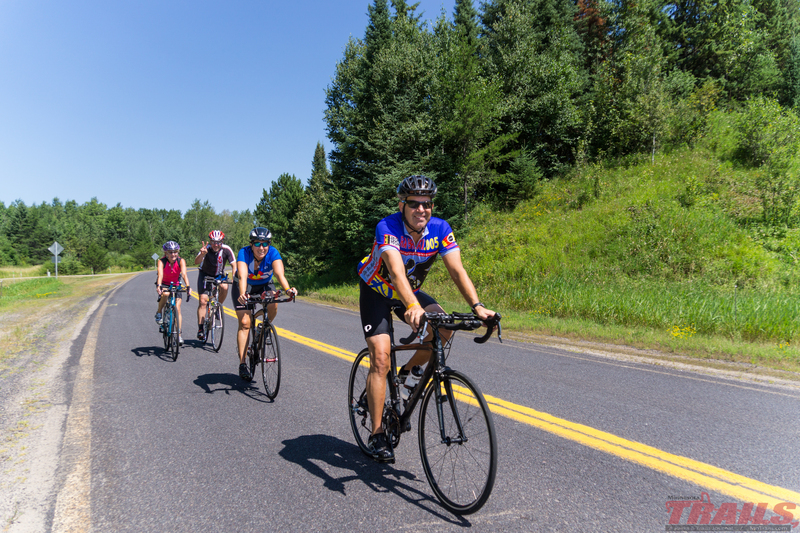 (Century Option – 100 miles and 3,300 feet of climbing total for day) From Bemidji, riders pedaled along the Great River Road/MRT (Mississippi River Trail) on our way to Itasca State Park and the Headwaters of the Mississippi. Established in 1891, Itasca is Minnesota’s oldest state park and totals more than 32,000 acres and includes more than 100 lakes. This is where the mighty Mississippi starts its winding journey 2,552 miles to the Gulf of Mexico! Many added 32 miles to their day for the Century option. Saturday, August 26. Day 3. Park Rapids to Staples. 72 miles. 1,000 feet of climbing. From Park Rapids we made our way to the Menahga Historical Museum for a glimpse into local history in an historic building which included an old-fashioned kitchen and living room with pump organ, a 1903 fire engine, and the Lake & Pine Baseball Hall of Fame. We also stopped by the England Prairie Pioneer Days Threshing Festival to watch threshing and sawmill demonstrations, an antique tractor show, and refuel on homemade pie. Sunday, August 27. Day 4. Staples to Walker. 70 miles. 1,100 feet of climbing. The final day of riding took us back north. We headed through Nimrod (home of the Nevis Muskie! ), and Akeley (home to the 33-foot tall statue of Paul Bunyan) before getting into Walker, where riders retrieved their cars and bid farewell to new and old friends.